Charlotte Brontë’s poem “Regret,” a part of her extensive early juvenilia, was first published in the 1846 The Poems of Currer, Ellis, and Acton Bell. Though responsible for spearheading the Brontë sisters’ effort to publish their original volume, in later life, Charlotte herself derided her early poetry as “chiefly juvenile productions; the restless effervescence of a mind that would not be still” (Neufeldt xli). Despite these objections, early publication and distribution struggles, and subsequent literary accomplishments, Poems continued to circulate in the wake of posthumous fame surrounding Charlotte Brontë’s life and work. The edition of Poems presented here is one reprinted in 1888 in a Smith, Elder & Co. volume as an addition to Brontë’s first novel, The Professor. Printed over 30 years after her death, the significance of this combined edition should be understood in the context of Charlotte Brontë’s literary celebrity and the role of popular biography. Scholars agree that Brontë’s renown is deeply intertwined with the facts and fictions of her life story, and her mythologized persona was perpetuated by biographical tropes that surrounded her. In light of Brontë’s heavily mediated reputation, print iterations of her early, otherwise failed or underappreciated works may have appealed to contemporary Victorian readers for their autobiographical potential. The tumultuous publication history of The Poems of Currer, Ellis, and Acton Bell is punctuated and significantly influenced by the popularity of Charlotte Brontë’s other literary successes. The first run of the collection, self-funded and published by Aylott and Jones in 1846, was dismal: after one year, only two of approximately 1000 copies printed were sold (Hargreaves 354). In the year following the first publications of Poems, Charlotte composed her popular, though at times controversial, novel, Jane Eyre, to critical and commercial acclaim. By September 1848, following Jane Eyre’s success, its publisher Smith, Elder & Co. agreed to reissue the remaining copies of Poems to favourable reviews: it sold 279 additional copies by July 1853, followed by an additional 450 in 1857 (two years after Charlotte’s death). In addition to Poems troubled history, The Professor was an even bigger initial failure that was rejected a total of nine times and never appeared in print in Brontë’s lifetime (Davies 73). In addition to Jane Eyre’s popularity, Charlotte Brontë’s posthumous literary celebrity was largely fuelled by the success of Elizabeth Gaskell’s prosaic biography, The Life of Charlotte Brontë. Published in 1857, Life revealed the grim, intriguing romance of the Brontës’ upbringing which caused it to be “treated almost as a novel itself” and began the tradition of “merging of Brontë facts and Brontë fictions” (Malone 176). In regards to the emergence of The Professor in the wake of Life, Catherine Malone also notes that “those critics who did pronounce upon the novel invariably did so in the light of the biography, endeavouring to equate the characters with those in Brontë’s life” (176-177). Following the popularity of Gaskell’s Life, Brontë’s body of work would be consistently read through the lens of the author’s life. Considering, then, her persisting popularity, and noting that both The Professor and Poems struggled significantly with early publication and distribution, the release of the combined volume over 30 years after Brontë’s death suggests that its market appeal was a part of the popular biographical discourse surrounding her. The title page and reorganization of the 1888 volume support the possibility that the edition was in part intended to capitalize on Life’s success. The title page identifies Currer Bell by name as Charlotte Brontë “The “author of “Jane Eyre,” “Shirley,” and “Villette.” The addition of Poems also features a notable reorganization: originally, the Brontës’ poems appeared in alternating order, but by 1888 they are sorted by author, beginning with Currer. Considering the absence of a table of contents and the addition of these author “chapters,” each poet is read in the context of her own type and style. In contrast to the stark anonymity (and obscurity) of the first Poems, the 1888 volume draws explicit attention to the poets’ individual identities. 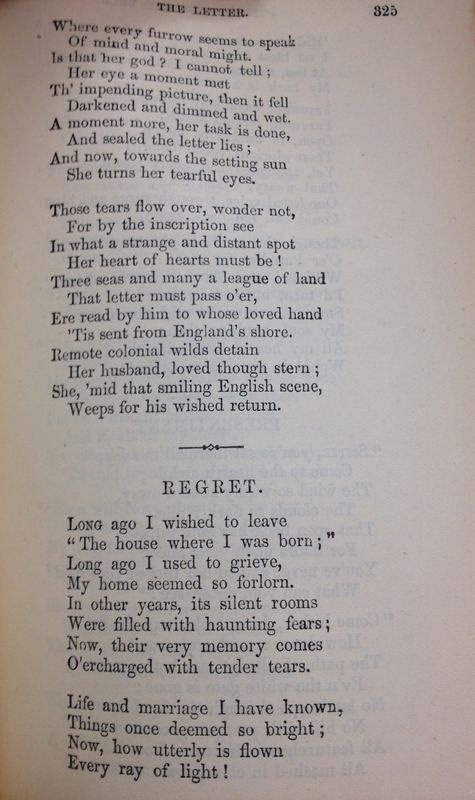 Considering this recontextualization of Brontë’s early work and Gaskell’s dramatization of the author’s life, it is possible to see the affective and even social implications of contemporary Victorians reading individual poems such as “Regret” with autobiography in mind. Lines such as “Long ago I used to grieve, / My home seemed so forlorn. / In other years, its silent rooms / were filled with haunting fears”, colored by Gaskell’s description of the “dim and lightless” moors around Haworth, contribute to the imaginary geography surrounding Brontë’s life. While reviews and reception histories for this combined volume are scarce, it remains fair to consider the radically different contextual climates that Brontë’s prose and poetry encountered in runs between 1846 and 1888. Bell, Currer. The Professor to which are added The Poems of Currer, Ellis, and Acton Bell. London: Smith, Elder, & Co., 1888. Print. Davies, Stevie. “’Three distinct and unconnected tales’: The Professor, Anges Grey and Wuthering Heights.” Ed. Heather Glen. The Cambridge Companion to the Brontës. New York: Cambridge UP, 2002. 72-98. Print. Hargreaves, G. D. “The Publishing of Poems by Currer, Ellis and Acton Bell.” Library Review 22.7: 353-356, 1970. Web. 20 November 2013. Leighton, Angela. “The Poetry.” Ed. Heather Glen. The Cambridge Companion to the Brontës. New York: Cambridge UP, 2002. 53-71. Print. Malone, Catherine. “’We Have Learnt to Love Her More Than Her Books’: The Critical Reception of Brontë’s Professor.” The Review of English Studies 47.186: 175-187, 1996. Web. 20 November 2013. Neufeldt, Victor A. The Poems of Charlotte Brontë: A New Text and Commentary. New York: Garland, 1985. Print.